This Pear Streusel Cake is the perfect fall and winter dessert with an easy-to make tender cake base and a delicious streusel topping - make it with fresh or canned pears for an easy dessert! Add the butter and the sugar to the bowl of your stand mixer and beat them together until the mixture is fluffy and becomes a pale colour (about 4-5 minutes). It's important that the butter is at room temperature before you begin. This will allow it to integrate properly with the other wet ingredients. Feel free to use a hand mixer and large mixing bowl if you prefer. Add the eggs and the vanilla and beat them in on medium speed until the mixture is smooth. It's a good idea to scrape down the bowl periodically to make sure everything is incorporated evenly. Add the milk and sour cream and beat in these ingredients on low speed until they're combined. To a separate bowl add the flour, the baking powder and the salt and mix these ingredients together with a fork or a wire whisk. Once they're all incorporated, dump the flour mixture into the bowl of the stand mixer with the wet ingredients. Turn the mixer on low and watch the batter come together. As soon as you see the batter form with streaks of flour throughout, turn off the mixer and remove the bowl. Over-mixing at this stage can cause an overly dense and dry cake with large air bubbles, which you definitely don't want. Using a rubber spatula, scrape down the sides of the bowl by hand and gently fold in the remaining flour. Be sure to stop folding as soon as everything is combined. Grease a 9x13 rectangular glass cake pan with some butter and pour the batter into the pan, using the spatula to push the batter into the corners and even out the surface. Don't worry, the batter will seem thick but it's supposed to be like that. Spread the sliced pears over the top of the batter. In a clean bowl mix together the flour, sugar and cinnamon for the streusel topping. Add in the melted butter and mix everything together with a fork until the mixture becomes crumbly. 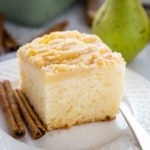 Sprinkle the streusel mixture over the cake and the pears, making sure to spread it at evenly as possible and into all the corners. Bake the cake at 350 degrees Fahrenheit for 47-50 minutes. When it's finished baking the topping will be slightly browned on top and when you insert a toothpick into the centre of the cake it will come out clean. Try to let the cake cool in the pan for at least 20 minutes before cutting into it...if you can wait that long! This cake is best the day it's made, but it stores well at room temperature for up to 2 days in an airtight container.